The annual value of any property comprising of buildings or lands appurtenant thereto, of which the assessee is the owner, is chargeable to tax under the head “Income from house property”. (i) Portions of property occupied by the assessee for business or profession carried on by him. 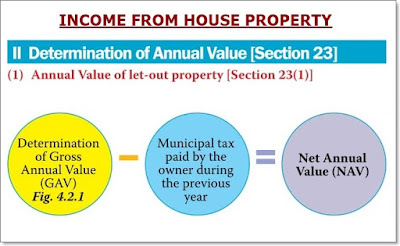 Where the property is self-occupied for own residence or unoccupied throughout the PY owing to his employment, business or profession carried on at any other place and residing at that other place in a building not belonging to him, its Annual Value will be Nil, provided no other benefit is derived by the owner from such property. If more than one property is so self-occupied/unoccupied, the assessee may claim benefit of Nil Annual Value in respect of any one property at his option. The other property(s) would be deemed to be let out, in respect of which Expected Rent would be the GAV. Where property is held as stock-in-trade and the whole or any part of the property is not let out during the whole or any part of the PY, the annual value of property or part of the property, for the period upto 1 year from the end of the F.Y. in which certificate of completion of construction of the property is obtained from the competent authority, shall be taken as “Nil”. (1) Pre-construction interest allowable as dedn in 5 equal installments from the P.Y. of completion of construction. 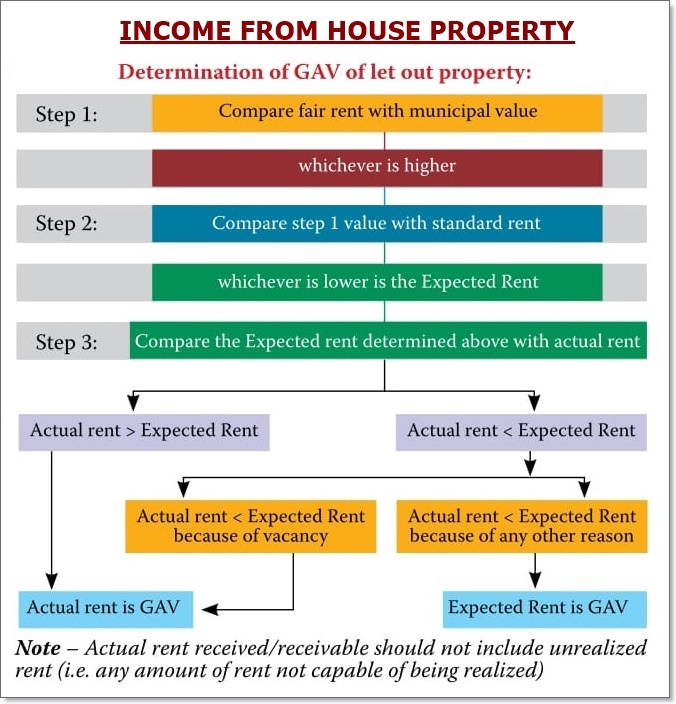 (2) If a portion of the property is let out and a portion self-occupied, then, income will be computed separately for let out and self-occupied portion. (iii) Taxable even if the assessee is not the owner of the property in the financial year of receipt/ realization. The annual value of the property of each co-owner will be Nil and each co-owner shall be entitled to a deduction of Rs. 30,000 /Rs. 2,00,000, as the case may be, on account of interest on borrowed capital. The income from such property shall be computed as if the property is owned by one owner and thereafter the income so computed shall be apportioned amongst each co-owner as per their specific share.